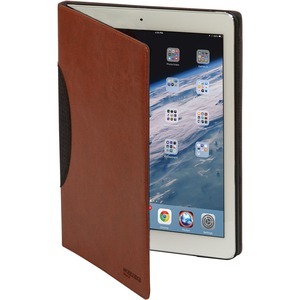 Guard your iPad Air against everyday bumps, drops and spills with this durable, lightweight case that securely attaches to your iPad Air while allowing full access to all ports and functions. The folio-style case also doubles as an adjustable viewing stand. Stylish Vegan leather exterior, soft micro fiber interior lining and a non-slip rubberized shell combine to provide attractive executive styling with a comfortable touch. This protective case also comes with a magnetic closure system providing smartcover functionality while the automatic sleep and wake feature gives you instant access when you need it.